This fantastic new set is perfect for adding a bit of 'posh' to your garden. 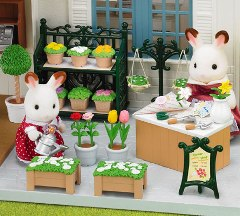 Your Sylvanians can shop at the Ornate Garden Shop for everything from wrought iron effect planters, to bunches of flowers. Figures, building and till not included.